Fall is my FAVORITE season!!! Let’s celebrate with a FREEBIE! 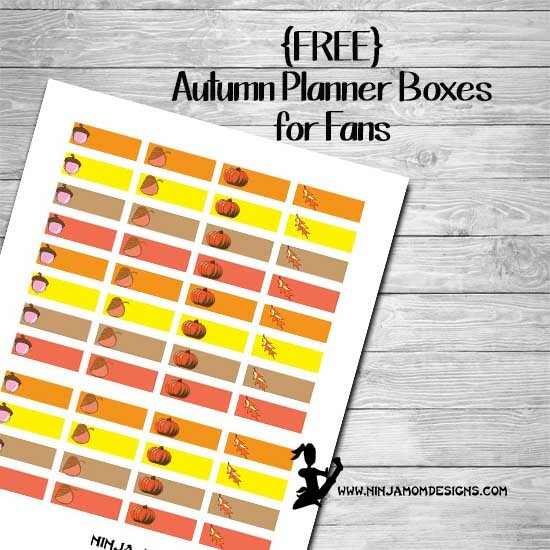 I’m offering a FREE printable- Autumn Themed Planner boxes for Facebook Fans of Ninja Mom Designs! Head over to Facebook, “like” Ninja Mom Designs. Then Click the Tab that says “Click Here for your Fan Freebie”. Click on the image and you will be taken to the downloadable PDF. The boxes measure 1.5″ by .5″… they fit perfectly in the weekly layout boxes of the Happy Planner or Erin Condren Planner. You can print the page on sticker paper or regular paper. Write appointments, reminders, and more on these cute, autumn themed boxes! – Save to your computer so you will ALWAYS have these autumn stickers on hand. If you print and use these in your planner, tag #ninjamomdesigns on Instagram so I can see them. I love to see other people using my FREE printables. I would love to be inspired by you as well!